본 발명에 따른 메모리 장치는, 복수의 물리적 저장 공간들을 갖는 데이터 저장부, 및 상기 데이터 저장부에 데이터를 저장하기 위한 제어부를 포함하되, 상기 물리적 저장 공간들 각각은, 사용자 데이터의 쓰기 동작시 상기 사용자 데이터를 저장하는 메인 영역, 및 상기 사용자 데이터 이외의 부가 데이터를 저장하는 스페어 영역을 포함하되, 상기 부가 데이터에는 상기 물리적 저장 공간에 대응하는 논리 어드레스 및 억세스될 다음 물리적 저장 공간을 지시하는 링크 값이 저장된다. Memory device in accordance with the present invention, comprising: a data storage unit, and a controller for storing data in the data storage unit having a plurality of physical storage space, each of the physical storage space, the on-write operation of the user data the main area for storing user data, and including, the spare area for storing additional data other than the user data, the additional data, the link value that indicates the following physical storage space is a logical address and the access corresponding to the physical storage space, It is stored. 본 발명은 메모리 장치, 그것을 포함하는 메모리 시스템, 그것의 맵핑 정보 복원 방법에 관한 것이다. The present invention relates to a memory system, its mapping information recovery method comprising the memory device, it. 플래시 메모리는 EEPROM(Electronically Erasable Programmable Read Only Memory)의 한 종류로 하드디스크를 대체할 목적으로 개발되었다. Flash memory has been developed to replace the hard disk as a kind of EEPROM (Electronically Erasable Programmable Read Only Memory). 기존 하드디스크에 비해 빠른 데이터 접근 성능을 보장하며, 부피와 전력 소모가 매우 작다. And ensures fast data access performance than conventional hard disk, volume and power consumption is very small. 또한 외부 충격에 강해 휴대용 기기의 저장 장치로 많이 사용되고 있다. Also resistant to external impact widely used as storage devices in portable devices. 플래시 메모리 카드, 휴대 전화, SSD 등 플래시 메모리를 사용하는 저장 장치에서는 논리 어드레스와 플래시 물리 어드레스 간의 맵핑 정보를 저장하는 것이 필수적이다. In the flash memory card, a storage device using a mobile phone, such as a flash memory, SSD, it is essential to store mapping information between the logical address and the physical address flash. 이 맵핑 정보는 플래시 메모리에 데이터 쓰기 요청시 변경이 발생된다. The mapping information is changed on request writing data to the flash memory is generated. 맵핑 정보의 변경시마다 맵핑 정보를 플래시에 저장하게 되면 성능 감소가 야기된다. When storing the changed mapping information in the mapping information each time a flash is performance degradation is caused. 이에 일반적으로 맵핑 정보는 램(RAM) 상에서 유지되었다 일정 주기로 플래시 메모리로 저장된다. In general, the mapping information is stored and held on a random access memory (RAM) at a constant period to the flash memory. 이때 갑작스런 전원 유실로 인하여, 맵핑 정보가 플래시 메모리에 저장되지 못할 수 있다. At this time, due to a sudden loss of power, it can not be mapped information is stored in flash memory. 이에 램 상에 유지되던 마지막 맵핑 상태를 복원하는 방법이 필수적이다. The method for restoring the final mapping state that were held on the ram is essential. 맵핑 정보가 플래시에 저장되는 빈도에 따라, 저장 장치의 쓰기 성능이 달라진다. According to the frequency mapping information is stored in the flash, it varies the write performance of the storage device. 따라서, 최대한 저장 빈도를 줄이는 방법이 필요하다. Thus, there is a need for a method of reducing the maximum storage rate. 또한, 맵핑 정보 관리 알고리즘에 따라 전원 종료 전의 마지막 맵핑 상태 복원에 소요되는 시간이 달라진다. Also, the time it takes depends on the final status map before restoring power off according to the mapping information management algorithm. 이러한 시간은 곧 저장 장치의 초기화 시간이 되며, 이는 시스템 부팅 시간을 결정짓는 중요한 요소가 된다. This time is shortly and the initialization time of the storage device, which is an important factor that determines the system boot time. 본 발명의 목적은 갑작스런 전원 유실에 의해 맵핑 정보를 복원하기 위한 메모리 시스템, 그것의 맵핑 정보 복원/관리 방법을 제공하는 데 있다. An object of the present invention to provide a memory system, its mapping information recovery / management method for recovering the mapping information by the sudden loss of power. 본 발명의 목적은 쓰기 성능을 향상시키는 메모리 시스템 및 그것의 맵핑 정보 복원 방법을 제공하는 데 있다. An object of the present invention is to provide a write memory mapping information system and its restoration method to improve performance. 본 발명의 목적은 맵핑 정보 복원 시간을 줄일 수 있는 메모리 시스템, 그것의 맵핑 정보 복원/관리 방법을 제공하는 데 있다. An object of the present invention is to provide a memory mapping information system that can reduce the recovery time, its mapping information recovery / management. 본 발명에 따른 메모리 장치는, 복수의 물리적 저장 공간들을 갖는 데이터 저장부; Memory device in accordance with the present invention, a data storage unit having a plurality of physical storage space; 및 상기 데이터 저장부에 데이터를 저장하기 위한 제어부를 포함하되, 상기 물리적 저장 공간들 각각은, 사용자 데이터의 쓰기 동작시 상기 사용자 데이터를 저장하는 메인 영역; And comprising a control unit for storing data in said data storage unit, each of the physical storage space, the main area for storing on-write operation of the user data the user data; 및 상기 사용자 데이터 이외의 부가 데이터를 저장하는 스 페어 영역을 포함하되, 상기 부가 데이터에는 상기 물리적 저장 공간에 대응하는 논리 어드레스 및 억세스될 다음 물리적 저장 공간을 지시하는 링크 값이 저장된다. And comprising: a spare area for storing additional data other than the user data, the additional data, the link value that indicates the following physical storage space is a logical address and the access corresponding to the physical storage space is saved. 실시 예에 있어서, 맵핑 정보 복원시 상기 링크 값에 따라 다음 물리적 저장 공간을 스캔하는 포워드 링크 스캔 방식이 사용된다. In one exemplary embodiment, the forward link and then scan method for scanning the physical storage space is used depending on the link value when restoring mapping information. 실시 예에 있어서, 상기 메모리 장치는, 상기 포워드 링크 스캔 방식으로 얻게 된 맵핑 정보가 저장되는 업데이트 메타 블록을 포함하고, 상기 업데이트 메타 블록은 상기 맵핑 정복 복원시 상기 포워드 링크 스캔 동작을 시작하는 물리적 저장 공간을 지시하는 시작점을 저장한다. In one exemplary embodiment, the memory device is physically stored, including updated metablock that map information is stored gain in the forward link, the scan method, the update metablock start the forward link scanning operation when restoring the mapping conquer stores the start point indicative of a space. 상기 포워드 링크 스캔 동작은 사용자 데이터가 저장되지 않은 물리적 저장 공간에 도달할 때 종료된다. The forward link scan operation is terminated when it reaches the physical storage space, the user data is not stored. 본 발명에 따른 메모리 시스템은, 메모리 장치; The memory system, the memory device according to the present invention; 및 상기 메모리 장치를 제어하는 제어기를 포함하되, 상기 메모리 장치는, 사용자 데이터 쓰기 동작시 상기 사용자 데이터를 저장하는 메인 영역; And comprising a controller for controlling the memory device, the memory device includes a main area for writing user data during operation stores the user data; 및 상기 사용자 데이터 이외의 부가 데이터를 저장하는 스페어 영역을 갖는 물리적 저장 공간을 포함하되, 상기 부가 데이터에는 상기 물리적 저장 공간에 대응하는 논리 어드레스 및 억세스될 다음 물리적 저장 공간을 지시하는 링크 값이 저장된다. And comprising a physical storage space that has a spare area for storing additional data other than the user data, the additional data, the link value that indicates the following physical storage space is a logical address and the access corresponding to the physical storage area is stored . 실시 예에 있어서, 상기 메모리 장치는, 제 1 맵핑 정보를 저장하는 메타 영역; In one exemplary embodiment, the memory device, the meta area for storing first mapping information; 및 사용자 데이터를 저장하는 사용자 데이터 영역을 포함하되, 상기 메모리 제어기는 초기화 동작시 상기 메타 영역으로부터 읽어온 상기 제 1 맵핑 정보와, 상기 사용자 데이터 영역을 상기 링크 값에 따라 포워드 링크 스캔 동작을 수행하여 얻게 된 제 2 맵핑 정보로부터 맵핑 정보를 복원한다. And comprising: a user data area for storing user data, the memory controller, with the whole of the first mapping information read from the meta area during initializing operation, by performing the forward link scanning operation along the user data area on the link value to recover the mapping information obtained from the second mapping information. 실시 예에 있어서, 상기 메타 영역은 상기 제 2 맵핑 정보 및 상기 포워드 링크 스캔 동작이 시작될 물리적 저장 공간을 지시하는 시작점이 저장되는 업데이트 메타 블록을 포함한다. In one exemplary embodiment, the metadata region includes update metablock that is a starting point for instructing the second mapping information, and the physical storage space for the forward link, the scanning operation is started stored. 실시 예에 있어서, 상기 제어기는 외부로부터 입력된 논리 어드레스에 따라 상기 다음에 스캔될 물리적 저장 공간을 지시하는 상기 링크 값을 계산하는 파일변환계층을 포함한다. In the embodiment, the controller according to the logical address input from the outside include a file conversion layer of calculating the link value indicative of a physical storage space to be scanned to the next. 본 발명에 따른 메모리 시스템의 맵핑 정보 복원 방법은: 상기 메모리 시스템은, 메모리 장치; Mapping information recovery method of the memory system according to the invention: the memory system includes a memory device; 및 그것을 제어하는 메모리 제어기를 포함하되, 상기 메모리 장치는 사용자 데이터의 쓰기 동작시 상기 사용자 데이터를 저장하는 메인 영역; And comprising: a memory controller which controls it, the memory device includes a main area for storing the user data when the writing operation of the user data; 및 상기 사용자 데이터 이외의 부가 데이터를 저장하는 스페어 영역을 갖는 물리적 저장 공간을 갖되, 상기 부가 데이터에는 상기 물리적 저장 공간에 대응하는 논리 어드레스 및 억세스될 다음 물리적 저장 공간을 지시하는 링크 값이 저장되고, 메타 영역으로부터 제 1 맵핑 정보를 읽어오고, 상기 사용자 영역을 상기 링크 값에 따라 포워드 링크 스캔 방식으로 스캔하여 제 2 맵핑 정보를 얻고, 상기 읽어온 제 1 맵핑 정보와 상기 제 2 맵핑 정보를 이용하여 맵핑 정보를 복원한다. And and has a physical storage area having a spare area for storing additional data other than the user data, the additional data, the link value indicative of a logical address, and then the physical storage space be accessed corresponding to the physical storage area is stored, It has been read the first mapping information from the meta area, and scanning the user area in the forward link scanning method according to the link value to obtain the second mapping information, using the second mapping information and the first mapping information on the read restore the mapping information. 본 발명에 따른 메모리 시스템은 맵핑 복원 동작시 포워드 링크 스캔 방식을 통하여 스캔 동작을 수행함으로써, 복원 시간을 대폭 줄일 수 있게 된다. The memory system according to the invention is able to drastically reduce, restore time by performing a scanning operation by the recovery operation when a forward link mapped scan. 본 발명은 성능 저하를 최소화하고, 초기화 시간을 단축시키는 맵핑 정보 복 원이 가능한 파일변환계층을 제공한다. The present invention minimizes performance degradation, and provides a mapping information to restore the file conversion layer capable of shortening the initialization time. 본 발명은 전원 유지 하드웨어를 구비하지 않고 효율적으로 맵핑 정보 복원시키는 메모리 시스템을 제공한다. The present invention provides a memory system to effectively restore the mapping information without having to keep the power hardware. 따라서, 저렴하면서, 수명이 연장되고, 크기를 줄일 수 있는 플래시 메모리 시스템이 제공된다. Therefore, inexpensive, life is extended, there is provided a flash memory system that can reduce the size. 이하, 본 발명이 속하는 기술분야에서 통상의 지식을 가진 자가 본 발명의 기술적 사상을 용이하게 실시할 수 있도록 본 발명의 실시 예를 첨부된 도면을 참조하여 설명한다. Will be described below with reference to the accompanying drawings, an embodiment of the present invention is to be self-of ordinary skill in the art to easily carry out the spirit of the present invention belonging invention. 본 발명에 따른 메모리 시스템은 초기화 동작시 메타 영역에 저장된 맵핑 정보와 포워드 링크 스캔 방식(Forward Link Scanning)으로 스캔함으로써 얻어진 맵핑 정보를 이용하여 맵핑 정보를 복원한다. The memory system according to the invention is to recover the mapping information using the mapping information is obtained by scanning the mapping information and the forward link scanning method (Forward Link Scanning) stored in the metadata area during initializing operation. 여기서 포워드 링크 스캔 방식은 어느 하나의 물리적 저장 공간을 스캔할 때 다음 스캔될 물리적 저장 공간 정보를 읽는 것을 말한다. The forward link scan method refers to reading the following physical storage space, the information to be scanned when scanning any of the physical storage space. 한편, 본 발명의 메모리 시스템에 적용되는 메모리 장치는 포워드 링크 스캔 방식에 적합한 쓰기 동작이 수행되도록 구현될 것이다. On the other hand, the memory devices in the memory system of the present invention will be implemented to perform a write operation to the appropriate forward link scan. 자세한 설명은 아래에서 하도록 하겠다. Detailed description will be shown below. 이로써, 본 발명의 메모리 시스템은 종래의 그것과 비교하여 맵핑 정보를 복원하는 시간이 단축되고, 또한 맵핑 정보를 효율적으로 관리하게 된다. Thus, the memory system of the present invention and the time to restore the mapping information shortened from the conventional one to it, is also efficiently manage the mapping information. 도 1은 본 발명에 따른 플래시 메모리 시스템의 하드웨어 구조를 보여주는 블록도이다. Figure 1 is a block diagram showing the hardware structure of the flash memory system according to the present invention. 도 1을 참조하면, 본 발명의 플래시 메모리 시스템(100)은 중앙처리장치(110), 램(120), 플래시 제어기(130), 및 플래시 메모리(140)를 포함한다. 1, the flash memory system 100 of the present invention includes a CPU 110, a RAM 120, a flash controller 130, and a flash memory 140. 본 발 명의 플래시 메모리 시스템(100)은 사용자 데이터 영역(160) 안에 맵핑 정보를 복원하기 위한 스캔 영역(165)을 갖는 플래시 메모리(140)를 포함한다. The name will be to the flash memory system 100 includes a flash memory 140 having a scanning area (165) for recovering the mapping information in the user data area 160. 이러한 스캔 영역(165)은 변동 가능하며 포워드 링크 스캔 방식으로 스캔된다. This scan area 165 is possible variations, and is scanned in the forward link scan. 플래시 메모리 시스템(100)의 맵핑 정보는 메타 영역(150)으로부터 읽어온 맵핑 정보와 스캔 영역(165)으로부터 스캔된 맵핑 관련 정보로부터 복원된다. Mapping information of the flash memory system 100 is restored from the information on the mapping and the mapping information scanned from the scan area 165 read from the Metadata area 150. 여기서 스캔된 맵핑 관련 정보는 메타 영역(150)에 업데이트되지 못한 맵핑 정보로써, 쓰기 동작시 물리적 저장 공간에 저장된 논리 어드레스이다. The mapping scan where information is mapped as information that could not be updated in the meta area 150, a logical address stored in the physical storage area when the writing operation. 여기서 논리 어드레스는 상기 물리적 저장 공간에 대응하는 어드레스이다. The logical address is an address corresponding to the physical storage space. 도 1에 도시된 메모리 시스템은 플래시 메모리를 갖는 시스템이다. The memory system shown in Figure 1 is a system with a flash memory. 그러나 본 발명의 메모리 시스템인 플래시 메모리를 갖는 시스템에 국한될 필요는 없다. But it not necessarily limited to a system with a flash memory, a memory system of the present invention. 본 발명의 메모리 시스템은 휘발성 메모리(예를 들어, DRAM,SRAM 등) 혹은 비휘발성 메모리(예를 들어, NAND FLASH,NOR FLASH, MRAM, PRAM, FRAM 등)를 갖는 시스템에 적용가능하다. The memory system of the present invention is applicable to a system with a volatile memory (e.g., DRAM, SRAM, etc.) or non-volatile memory (e.g., NAND FLASH, NOR FLASH, MRAM, PRAM, FRAM, and so on). 중앙처리장치(110)는 플래시 메모리 시스템(100)의 전반적인 동작을 제어한다. The CPU 110 controls the whole operation of the flash memory system 100. 램(120)은 플래시 메모리 시스템(100)의 동작에 필요한 데이터를 임시로 저장하는데 이용된다. RAM 120 is used to store the data required for the operation of a flash memory system 100 on a temporary basis. 이러한 램(120)은 휘발성 메모리 장치로써, 디램(DRAM), 에스램(SRAM) 등이 될 수 있다. The RAM 120 may be include as a volatile memory device, a DRAM (DRAM), S-RAM (SRAM). 메모리 제어기(130)는 호스트의 읽기/쓰기 요청에 따라 플래시 메모리(140)를 제어한다. The memory controller 130 controls the flash memory 140 according to a read / write request from the host. 또한 메모리 제어기(130)는 플래시 메모리(140)의 에러 정정을 위한 ECC 엔진을 장착할 수 있다. In addition, memory controller 130 may be equipped with an ECC engine for error correction in the flash memory 140. 플래시 메모리(140)는 플래시 메모리(140)를 관리하는데 필요한 관리 정보를 저장하는 메타 영역(150), 및 호스트 요청에 따른 사용자 데이터를 저장하는 사용자 데이터 영역(160)을 포함한다. The flash memory 140 comprises a flash memory, metadata for storing management information necessary to manage the 140 region 150, and the user data area 160 for storing user data corresponding to the host's request. 본 발명의 플래시 메모리(140)는 포워드 링크 스캔 방식에 적합하도록 구현된다. Flash memory 140 of the present invention is implemented to be suitable for forward link scan. 특히, 플래시 메모리(140)에서는 사용자 데이터의 쓰기 동작시 입력된 논리 어드레스에 대응하는 물리적 저장 공간에 사용자 데이터, 논리 어드레스, 및 링크 값이 저장된다. In particular, the flash memory 140 in the user data, logical address, and a link value is stored in the physical storage space corresponding to the logical address input during a write operation of user data. 여기서 링크 값은 스캔되는 물리적 저장 공간에 대하여 다음에 스캔 될 물리적 저장 공간을 지시하는 값이다. The link value is a value indicative of a physical storage space to be scanned in the following with respect to the physical storage space to be scanned. 메타 영역(150)에 저장되는 관리 정보에는 맵핑 정보가 포함된다. Management information stored in the metadata region 150 includes the mapping information. 또한 사용자 데이터 영역(160)에는 맵핑 정보를 복원하기 위하여 포워드 링크 스캔 동작이 수행될 스캔 영역(165)이 포함된다. It is also the user data area 160 includes the forward link scanning operation the scanning area 165 to be performed to recover the mapping information. 스캔 영역(165)에는 메타 영역(150)에 업데이트되지 못한 맵핑 관련 정보가 포함된다. Scan area 165 includes a map-related information could be updated in the metadata region 150. 본 발명에서는 초기화 동작시 이러한 스캔 영역(165)이 포워드 링크 스캔 방식으로 스캔되도록 구현된다. According to the present invention it is implemented such that during the setup operation the scan area 165 is scanned in the forward link scan. 여기서 스캔 영역(165)은 스캔될 페이지들 즉, 액티브 페이지들(Active Page)들의 집합체를 의미한다. The scan area 165 refers to an aggregate of the page to be scanned that is, the active page (Page Active). 이러한 스캔 영역(165)은 고정된 것이 아니라 변동 가능한 영역이다. This scan area 165 is not possible to change the fixed area. 또한 스캔 영역(165)의 크기는 고정될 수도 있고, 변동되게 구현될 수도 있다. Also, the size of the scan area 165 may be fixed, may be implemented to be variable. 예를 들어, 스캔 영역(165)은 메타 영역(150)에 저장된 스캔 동작을 시작하는 물리적 저장 공간 정보에 근거한 시작 페이지부터 포워드 링크 스캔 방식으로 스캔 동작을 시작한다. For example, the scan area 165 starts the scanning operation in the forward link from the start page scan method based on the physical storage space information to start a scanning operation is stored in the metadata region 150. 도 1에 도시된 플래시 메모리(150)는 데이터 저장 영역만이 도시되어 있지만, 이러한 데이터 저장 영역에 데이터를 저장하기 위한 제어부(도시되지 않음)를 포함한다. The flash memory 150 shown in Figure 1, but only the data storage area is shown, a controller (not shown) for storing data in such a data storage area. 플래시 메모리 시스템(100)은 초기화 동작시 혹은 맵핑 정보 복원 동작시 스캔 영역(165)을 포워드 링크 스캔 방식으로 스캔한다. Flash memory system 100 scans the initialization operation during the mapping information recovery operation or during a scan area 165 in a forward link scan. 이러한 스캔 동작은 각각의 물리적 저장 공간에 저장된 링크 값에 의거하여 수행된다. This scanning operation is performed on the basis of the link the value stored in each of the physical storage space. 여기서 링크 값은 다음에 스캔될 물리적 저장 공간을 지시하는 어드레스이다. The link value is an address indicative of a physical storage area to be scanned next. 즉, 링크 값은 다음에 스캔할 대상을 가리키는 포인터이다. That is, the link value is a pointer to a target to be scanned next. 자세한 설명은 도 5에서 설명하도록 하겠다. Detailed description will be described in FIG. 플래시 메모리는 다른 메모리 혹은 인터페이스와 읽기/쓰기 단위가 다르다. Flash memory differs from the read / write unit and another memory or interface. 즉, 플래시 메모리는 일반적인 하드 디스크가 섹터 단위로 읽기/쓰기 동작을 수행하는 것과 달리, 페이지 단위로 읽기/쓰기 동작을 수행한다. That is, the flash memory performs a read / write operation on a page-by-page basis, as opposed to performing a conventional hard disk, the read / write operation on a sector-by-sector basis. 또한, 플래시 메모리는 쓰기 동작에 앞서 반드시 소거 연산을 필요로 한다. Further, the flash memory needs to be erased prior to the operation of writing operation. 이때, 플래시 메모리는 복수의 페이지들로 구성된 블록 단위로 소거 동작을 수행한다. In this case, the flash memory performs erase operations in units of blocks consisting of a plurality of pages. 이러한 플래시 메모리의 특성으로 인하여, 플래시 메모리를 구비한 플래시 메모리 시스템은 플래시 메모리의 효율적으로 관리하기 위한 소프트웨어 모듈을 구비하고 있다. Due to the nature of such a flash memory, a flash memory system including a flash memory is provided with a software module for managing a flash memory efficiently. 이러한 플래시 메모리를 관리하는 소프트웨어 모듈을 파일변환계층(Flash Translation Layer: FTL)이라고 부른다. A software module for managing flash memory, these file conversion Layer called (Flash Translation Layer FTL). 도 2는 본 발명에 따른 플래시 메모리 시스템의 소프트웨어 구조상에 파일변환계층의 위치를 보여주는 블록도이다. Figure 2 is a block diagram showing the location of the file conversion layer in the software structure of a flash memory system according to the present invention. 도 2를 참조하면, 파일변환계층(FTL)은 파일 시스템으로부터 전달받은 논리 어드레스 및 개수를 파라미터로하여 플래시 메모리(140)의 읽기/쓰기 동작을 위한 어드레스 변환 과정을 수행한다. 2, the file translation layer (FTL) is performing an address conversion to the logical address and the number received from the file system as a parameter for the read / write operation of the flash memory 140. 파일 시스템으로부터 전달받은 어드레스 등은 호스트(도시되지 않음)로부터 요청된다. Address received from the file system and the like is requested from the host (not shown). 즉, 파일 변환계층(FTL)은 호스트로부터 전송된 논리 어드레스(Logical Address: LA)를 물리 어드레스(Physical Address: PA)로 변환한다. That is, the file translation layer (FTL) is a logical address transferred from the host is converted to:: (Physical Address PA) a (Logical Address LA) the physical address. 도 2를 다시 참조하면, 파일변환계층(FTL)은 크게 어드레스 변환 계층(Address Translation Layer: ATL), 가상 플래시 계층(Virtual Flash Layer: VFL), 및 플래시 인터페이스 계층(Flash Interface Layer: FIL)로 구분된다. Referring back to Figure 2, the file translation layer (FTL) is larger address conversion layer, separated by: (FIL Flash Interface Layer) (Address Translation Layer:: ATL), a virtual flash layer (Virtual Flash Layer VFL), and a flash interface layer do. 어드레스 변환 계층(ATL)은 파일 시스템으로부터 전송된 논리 어드레스(LA)을 논리 페이지 어드레스(Logical Page Address)로 변환한다. Address Translation Layer (ATL) converts the logical address (LA) sent from the file system to a logical page address (Logical Page Address). 어드레스 변환 계층(ATL)은 논리 어드레스 공간의 어드레스 변환 과정을 수행한다. Address Translation Layer (ATL) is performing an address conversion of a logical address space. 즉, 어드레스 변환 계층(ATL)은 호스트에서 전송된 논리 어드레스(LA)에 대하여 플래시 메모리(140)의 논리 페이지 어드레스(LPA)가 맵핑되는 맵핑 정보에 의거하여 어드레스 변환 과정을 수행한다. That is, the address conversion layer (ATL) is with respect to the logical address (LA) sent from the host on the basis of the mapping information to the logical page address (LPA) of the flash memory 140 is mapped performs the address conversion process. 이러한 논리 대 논리 어드레스 맵핑 정보(Logical to Logical Address mapping information: 이하 'L2L'이라고 함)은 메타 영역(150)에 저장된다. The logical-to-logical address mapping information (Logical to Logical Address mapping information: hereinafter referred to as 'L2L') is stored in the metadata region 150. 가상 플래시 계층(VFL)은 어드레스 변환 계층(ATL)로부터 변환된 논리 페이지 어드레스(LPA)을 가상 페이지 어드레스(Virtual Page Address:VPA)로 변환한다. Virtual flash layer (VFL) is a logical page address (LPA) conversion from the address translation layer (ATL) virtual page address: is converted to (Virtual Page Address VPA). 여기서 가상 페이지 어드레스(VPA)는 가상의 플래시 메모리의 물리적 어드레스에 대응한다. The virtual page address (VPA) corresponds to a physical address in a virtual flash memory. 가상의 플래시 메모리에는 플래시 메모리(140)의 배드 블록 처리 과정을 완료함으로써 배드 블록이 존재하지 않는다. The bad blocks do not exist, by the flash memory of the virtual has completed processing a bad block in the flash memory 140. 즉, 가상 페이지 어드레스(VPA)는 배드 블록을 제외한 플래시 메모리(140)의 물리적 블록에 대응한다. In other words, the address (VPA) is a virtual page corresponding to the physical blocks of the flash memory 140, other than the bad block. 가상 플래시 계층(VFL)은 메타 영역(150)에 저장된 논리 대 가상 어드레스 맵핑 정보(Logical to Virtual Address Mapping: 이하 'L2V'라고 함) 및 스캔 영역(165)으로부터 스캔된 정보(Scanned Information)을 이용하여 논리 대 가상 어드레스 맵핑 정보(L2V)을 복원하는 복원 알고리즘(Recovering Algorithm)은 포함한다. Virtual flash layer (VFL) is meta area 150 logical to virtual address mapping information stored in: using the information (Scanned Information) scanned from the (Logical to Virtual Address Mapping hereinafter referred to as 'L2V') and the scanning area (165) the reconstruction algorithm comprises restoring a logical-to-virtual address mapping information (L2V) (Recovering algorithm) it is. 가상 플래시 계층(VFL)은 이러한 복원 알고리즘을 통하여 복원된 논리 대 가상 어드레스 맵핑 정보(L2V)을 이용하여 가상 어드레스 공간의 어드레스 변환 과정을 수행한다. Virtual flash layer (VFL) is by using a logical address-to-virtual mapping information (L2V) restored through such a reconstruction algorithm performs address conversion of the virtual address space. 가상 플래시 계층(VFL)은 플래시 제어기(130)에서 수행되는 어드레스 변환 계층(ATL) 및 기타의 인터페이싱 동작시 소거 연산이 필요한 플래시 메모리(140)를 대신하여 플래시 제어기(130) 상에서 이루어지는 제어 동작을 담당한다. Virtual flash layer (VFL) is in charge of the control operation made on the flash controller 130 in place of the address conversion layer (ATL), and other flash memory 140 that require an erase operation when interfacing operation performed by the flash controller 130 do. 플래시 인터페이스 계층(FIL)는 가상 플래시 계층(VFL)의 가상 페이지 어드레스(Virtual Page Address)을 플래시 메모리(140)의 물리 페이지 어드레스(Physical Page Address)로 변환한다. Flash Interface Layer (FIL) converts the virtual page address (Virtual Page Address) of a virtual flash layer (VFL) to a physical page address of the flash memory (140) (Physical Page Address). 플래시 인터페이스 계층(FIL)은 플래시 메모리(140)와의 인터페이싱 동작을 수행하는 위한 로우 레벨 동작을 수행한다. Flash Interface Layer (FIL) performs low level operation for performing an interfacing operation with the flash memory 140. 예를 들어, 플래시 메모리(140)의 하드웨어를 제어하기 위한 로우 레벨 드라이버, 플래시 메모리(140)로부터 읽혀진 데이터의 에러를 정정하기 위한 에러 정정코드(Error Correction Code: ECC) 및 오류 블록 관리 모듈(Bad Block Management :BBM) 등이 플래시 인터페이스 계층(FIL)에 포함된다. For example, the flash memory 140, an error correction code for correcting an error in the read data from the low level driver, a flash memory 140 for controlling the hardware of the (Error Correction Code: ECC) and error block management module (Bad Block Management: such as BBM) is included in the flash interface layer (FIL). 모든 플래시 메모리 시스템은 갑작스런 전원 유실이 발생했을 경우를 대비하는 방법이 반드시 필요하다. All flash memory system is a way to prepare for when a sudden power loss occurs is necessary. 이를 처리하기 위해서 크게 하드웨어 방법과 소프트웨어 방법이 있다. To address this, there are significant hardware manner and a software manner. 하드웨어 방법으로는 슈퍼 캡(super-cap) 혹은 배터리 등과 같이 맵핑 정보를 저장하기 위해 전원을 유지시켜 주는 방법이 있다. Hardware method, there is a method to maintain the power supply for storing the mapping information such as a super capacitor (super-cap) or a battery. 소프트웨어 방법으로는 파일변환계층의 맵핑 알고리즘이 전원 차단에 대비해 맵핑 정보를 구성하고, 복원 가능하도록 저장하는 방법이 있다. Software method is a method of storing a mapping algorithm of the file conversion layer configured to enable the mapping information in preparation for power-down, and to restore. 하드웨어 방법은 소프트웨어 방법 대비 저장 장치에 들어가는 부품 수 및 가격, 물리적인 공간 제약, 수명 등의 측면에서 불리하지만, 파일변환계층 알고리즘을 간략화시킬 수 있는 장점이 있다. Hardware method is disadvantageous in terms of number of parts compared to entering the storage software method and price, physical space limitations, shelf life, but there is a merit capable of simplifying the algorithm file conversion layer. 소프트웨어 방법은 상술 된 하드웨어의 단점을 극복할 수 있지만, 파일변환계층의 맵핑 알고리즘에 따라, 맵핑 데이터를 저장하는 양과 빈도의 차이가 있다. Software method has a difference that stores mapping data according to the mapping algorithm, but to overcome the disadvantages of the above-described hardware, file conversion layer volume and frequency. 이는 곧 성능 차이를 만들어 낸다. This produces soon make a difference in performance. 즉, 저장하는 양이 많아 질수록 성능은 감소하며, 자주 맵핑 데이터를 플래시 메모리에 저장할수록 성능은 감소한다. That is, the quality, the amount of storage is much reduced performance, and the more frequently store the mapping data in the flash memory, the performance is reduced. 또한, 저장 장치 초기화 시에 맵핑 정보를 복원하는 시간 또한 파일변환계층 맵핑 알고리즘에 따라 달라진다. In addition, time is also dependent on the file translation layer mapping algorithm to restore the mapping information at the time of initializing a storage device. 도 3은 본 발명에 따른 파일 변환 계층(FTL)을 설계하기 위하여 고려한 관점들을 보여주는 도면이다. Figure 3 is a block diagram showing the point of view taking into account to design a file translation layer (FTL) in accordance with the present invention. 도 3을 참조하면, 본 발명의 파일변환계층(FTL)은 맵핑 자유도, 성능 효율성, 웨어 레벨링, 및 동작 시간 등이 다양한 관점들을 고려하여 설계되었다. 3, the file translation layer (FTL) of the present invention is designed to include mapping freedom, performance efficiency, wear leveling, and the operating time taking into account the various points of view. 본 발명의 파일변환계층(FTL)은 종래의 그것과 비교하여 맵핑 자유도가 증가되고, 성능이 향상되고, 마모도가 감소되고, 또한 동작 시간이 감소되도록 구현된다. File Translation Layer (FTL) of the present invention increases the degree of freedom as compared with the conventional mapping it, the performance is improved, and wear is reduced, and is also implemented to reduce the operation time. 여기서 파일변환계층(FTL)의 성능이 향상된다는 것은, 예를 들어, 도 4에 도시된 바와 같이, 논리 페이지 번호(Logical Page Number:LPN)을 입력받아 논리 대 가 상 어드레스 맵핑 알고리즘에 의거하여 출력되는 가상 페이지 번호(Virtual Page Number: VPN)의 개수(n)가 감소되는 것을 말한다. Wherein Being improves the performance of the file translation layer (FTL), for example, as shown in Figure 4, a logical page number (Logical Page Number: LPN) input receive the logic for an output based on the address mapping algorithm says that the number (n) a reduction of: (VPN virtual page number) that the virtual page number. 여기서 논리 페이지 번호(LPN)은 논리 페이지 어드레스(Logical Page Address)에 대응하는 번호이고, 가상 페이지 번호(Virtual Page Address)에 대응하는 번호이다. The logical page number (LPN) is a number corresponding to the logical page address (Logical Page Address), a number corresponding to the virtual page number (Virtual Page Address). 상술 된 파일변환계층(FTL)에 따라 맵핑 정보의 복원 동작을 수행하기 위해서, 본 발명의 플래시 메모리 시스템(100)은 사용자 데이터의 쓰기 동작시 각 물리적 페이지에 대응하는 논리 페이지 어드레스(Logical Page Address)와 다음 스캔 대상의 물리적 저장 공간(즉, 가상 페이지 어드레스)를 함께 저장하도록 구현된다. 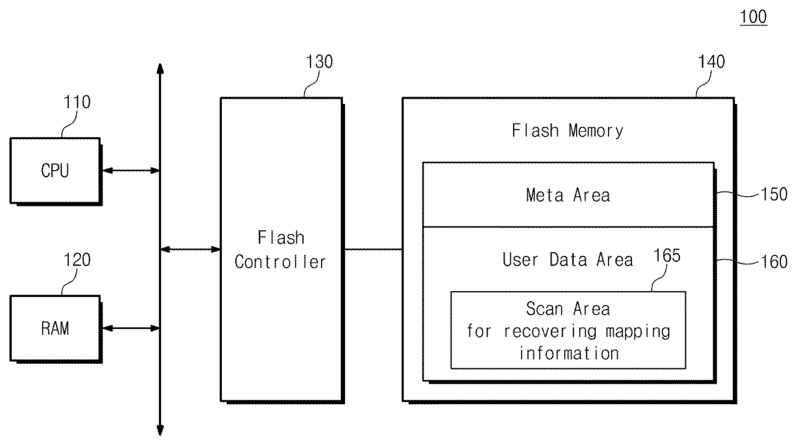 In order to carry out the recovery operation of the mapping information according to the file translation layer (FTL) above, the flash memory system 100 includes a logical page address (Logical Page Address) corresponding to the physical page-write operation of user data according to the present invention the physical storage space of the next scan is implemented to store the target with (that is, the virtual page address). 도 5는 본 발명에 따라 맵핑 정보를 복원하는데 필요한 맵핑 관련 정보를 저장하고 있는 메모리 영역을 보여주는 도면이다. 5 is a view showing a memory area that stores the mapping information needed to restore the mapping information in accordance with the present invention. 도 5을 참조하면, 플래시 메모리(140)는 플래시 메모리(140)와 관련된 맵핑 정보가 저장된 메타 영역(150)과 메타 영역(150)에 아직 업데이트되지 못한 맵핑 관련 정보가 저장된 스캔 영역(165)을 포함한다. Referring to Figure 5, the flash memory 140 is a flash memory 140 and stored in the mapping information associated metadata region 150 and meta area scan area 165 is mapped to the relevant information could not be updated yet stored in the unit 150 It includes. 메타 영역(150)은 크게 메인 메타 블록(151) 및 업데이트 메타 블록(152)을 포함한다. The metadata region 150 is largely a main metablock 151 and the update metablock 152. 메인 메타 블록(151)에는 논리 대 논리 어드레스 맵핑 정보(L2L), 논리 대 가상 어드레스 맵핑 정보(L2V), 및 가상 대 논리 어드레스 맵핑 정보(Virtual to Logical Address Mapping Information: 이하 'V2L'이라고 함)이 저장된다. Main metablock 151, the logical-to-logical address mapping information (L2L), the logical-to-virtual address mapping information (L2V), and virtual-to-logical address mapping information (Virtual to Logical Address Mapping Information: hereinafter referred to as 'V2L') is It is stored. 여기서 가상 대 논리 어드레스 맵핑 정보(V2L)는 논리 대 가상 어드레스 맵핑 정보(L2V)의 역함수가 된다. The virtual to logical address map information (V2L) is the inverse of the logical-to-virtual address mapping information (L2V). 메인 메타 블록(151)에 저장된 맵핑 정보는 가장 최신의 맵핑 상태가 아니다. Mapping information stored in the main meta-block 151 is not the most up-to-date status of the mapping. 업데이트 메타 블록(152)은 메인 메타 블록(151)에 저장된 맵핑 상태에서 업데이트된 맵핑 정보를 따로 저장한다. The update metablock 152 is storing the updated mapping information in the mapping status stored in the main metablock 151 separately. 여기서 업데이트 메타 블록(152)은 맵 로그 블록(Map Log Block)으로 불린다. The update metablock 152 is referred to as a block map log (Log Map Block). 업데이트 메타 블록(152)의 각 개별 페이지에는 링크 값에 의한 연결된 항목 길이가 최대가 될 때, 즉, 더 이상 확장할 수 없을 때까지 업데이트 정보가 저장된다. When the maximum length of the item connected by a link value for each individual page of the update metablock 152, that is, the update information is stored until no longer be extended. 또한, 업데이트 메타 블록(152)의 각 개별 페이지에는 시작점(Start Point)이 저장된다. In addition, the update for each individual page of the metablock 152 is stored in the starting point (Start Point). 이러한 시작점은 맵핑 정보 스캔을 시작하는 위치를 지시한다. This starting point will indicate the position to start scanning the mapping information. 따라서, 플래시 메모리 시스템(100)의 초기화 동작시 이러한 시작점을 이용하여 맵핑 정보의 스캔 동작이 가능하게 된다. Thus, during the initialization operation of the flash memory system 100 is using such a scanning operation of the start point it can be mapped information. 사용자 영역(160)은 사용자 데이터가 저장되는 복수의 블록들(161,162,163,164,166,167)을 포함한다. The user region 160 includes a plurality of blocks in which user data is stored (161162163164166167). 여기서 블록들(166,167)을 스캔 영역(165)이다. Wherein a scan area 165, the blocks (166 167). 본 발명의 스캔 영역(165)은 사용자 데이터 영역(160)에 고정된 영역이 아니라, 시작점의 물리적 저장 공간에 따라 변경되는 영역을 의미한다. Scanning area 165 of the present invention is not a fixed area in the user data area 160, and a region that changes depending on the physical storage space of the starting point. 도 5에서는 스캔 영역(150)이 2개의 블록으로 구성되었지만, 이러한 스캔 영역(165)의 크기(스캔할 블록의 개수)는 여기에 국한되지 않는다. Although Figure 5, the scanning area 150 is composed of two blocks, the size (number of blocks to be scanned) in the scan area 165 is not limited to this. 스캔 영역(165)의 크기는 파일 변환 계층(FTL)의 알고리즘에 따라 결정된다. The size of scanned area 165 is determined by the algorithm of the file translation layer (FTL). 예를 들어, 이러한 알고리즘은 프로그램되지 않은 클린 페이지가 발견될 때까지 스캔 동작이 수행되도록 구현될 수 있다. For example, these algorithms can be implemented so that the scanning operation is performed until the page is found not clean program. 사용자 영역(160)의 각 페이지는 사용자 데이터가 저장되는 영역과, 스캔 동작을 수행하는데 필요한 정보가 저장되는 영역으로 구분된다. Each page in the user area 160 is divided into a region where user data is stored in the storage area and the information needed to perform the scanning operation. 여기서 스캔 동작을 수행하는데 필요한 정보에는 각 페이지의 물리 어드레스에 대응하는 논리 페이지 번호(LPN) 및 다음 스캔할 물리 어드레스, 즉, 링크 값(LINK)이 포함된다. The information necessary to perform a scanning operation includes the physical address, that is, the value link (LINK) to scan the logical page number (LPN), and then corresponding to the physical address of each page. 본 발명의 논리 페이지 번호(LPN) 및 링크 값(LINK)은 각 페이지의 스페어 영역에 저장되도록 구현될 수 있다. Logical page number of the present invention (LPN) and the link values ​​(LINK) may be implemented to be stored in the spare area of ​​each page. 본 발명의 메모리 장치는 플래시 메모리에만 국한되지 않으며, 사용자 데이터 쓰기 동작시 사용자 데이터를 저장하는 메인 영역과, 상기 사용자 데이터를 제외한 부가 데이터를 저장하는 스페어 영역을 갖는 물리적 저장 공간을 포함하는 메모리 장치이면 된다. Memory device according to the present invention is not limited to flash memory, the memory device including a physical storage space having a main area and a spare area for storing additional data other than the user data to store the user data the user data during a write operation if do. 여기서 부가 데이터에는 사용자 데이터가 저장된 논리 어드레스, 및 다음에 스캔될 물리 어드레스가 포함된다. Here are additional data includes a physical address to the logical address to be scanned, and then the user data is stored. 도 6은 본 발명에 따른 2KB 페이지의 구성을 보여주는 도면이다. 6 is a view showing a configuration of a 2KB page in accordance with the present invention. 도 6을 참조하면, 페이지는 사용자 데이터가 저장되는 2048 바이트의 메인 영역과 스캔 정보를 비롯한 부가적인 데이터가 저장되는 64 바이트의 스페어 영역을 포함한다. 6, the page includes a spare area of ​​64 bytes which is the additional data including the main area and the scan information of 2048 bytes in which user data is stored is stored. 메인 영역은 네 개의 섹터들로 구성된다. The main area is composed of four sectors. 하나의 섹터의 크기는 512 바이트이다. The size of one sector is 512 bytes. 스페어 영역은 논리 페이지 번호(LPN) 및 링크 값(LINK)을 저장한다. Spare area stores a logical page number (LPN) and the link values ​​(LINK). 스페어 영역의 크기는 64 바이트이고, 논리 페이지 번호의 크기는 4 바이트이고, 링크 값의 크기는 4 바이트이다. The size of the spare area is 64 bytes, the size of the logical page number is 4 bytes, and the size of the link value is 4 bytes. 스페어 영역에는 에러정정코드 값이 포함될 수 있다. Spare area may include an error correction code value. 도 7은 본 발명에 따른 4KB 페이지의 구성을 보여주는 도면이다. 7 is a view showing a configuration of a 4KB page in accordance with the present invention. 도 7를 참조하면, 페이지는 사용자 데이터가 저장되는 4096 바이트의 메인 영역과 스캔 정보가 저장되는 128 바이트의 스페어 영역을 포함한다. Referring to Figure 7, the page includes a spare area in which user data is 128 bytes is stored in the main area and the scan information of 4096 bytes are stored. 메인 영역은 8 개의 섹터들로 구성된다. The main area is composed of eight sectors. 스페어 영역은 4 바이트의 논리 페이지 번호(LPN) 및 4 바이트의 링크 값(LINK)을 포함한다. The spare area comprises a link value (LINK) of the 4 bytes logical page number (LPN) and 4 bytes. 본 발명의 링크 값(LINK)은 스캔 동작시 다음 스캔할 페이지를 지시하는 물리적인 어드레스이다. Value link (LINK) of the present invention is a physical address indicating a page to be scanned during next scanning operation. 이러한 링크 값(LINK)은 각 페이지의 쓰기 동작시 파일 변환 계층(FTL)의 알고리즘에 의거하여 결정된다. The value links (LINK) is determined on the basis of the algorithm of the file translation layer (FTL) during a write operation for each page. 이렇게 결정된 링크 값은 사용자 데이터 및 논리 페이지 번호와 함께 각 페이지에 저장된다. Link thus determined values ​​are stored in each page, along with the user data and the logical page number. 이를 위하여, 파일 변환 계층(FTL)은 쓰기 동작시 다음 스캔할 페이지가 어디가 최적인지를 알기 위한, 즉 링크 값을 결정하는 알고리즘을 포함한다. For this, the file translation layer (FTL) comprises an algorithm for determining the value that is linked to know whether the best Where the page to be scanned during the next write operation. 도 8은 링크 값에 의한 액티브 페이지의 구성 예를 보여주는 도면이다. 8 is a view showing a configuration example of the active page by a link value. 여기서 액티브 페이지는 맵핑 정보 복원 동작시 스캔될 페이지들을 말한다. The active page is the page to be scanned during said mapping information recovery operation. 도 8을 참조하면, 스캔 동작은 다음과 같이 수행된다. 8, a scanning operation is performed as follows. 업데이트 메타 블록(152)에 저장된 시작점이 지시하는 페이지부터 시작하여, 각 페이지에 저장된 링크 값에 따라 스캔 동작이 수행된다. Starting with the page that is the starting point stored in the update metablock 152 is directed to a scanning operation is performed according to link the value stored in each page. 여기서 각 페이지의 스캔 동작이 수행된다는 것은 각 페이지에 저장된 논리 페이지 번호(LPN)를 읽어 가상 물리 페이지 번호(VPN)에 대응시키는 것을 의미한다. Here Being a scan operation for each page carried out means to read the logical page number (LPN) stored in each page corresponding to the virtual physical page number (VPN). 링크 값(LINK)을 따라 각 페이지에 저장된 논리 페이지 번호(LPN)을 읽으면서 맵핑 정보의 복원이 이루어진다. As you read the link value (LINK) logical page number (LPN) is stored on each page is made in accordance with the restoration of the mapping information. 이때 연결된 항목의 마지막은 아직 프로그램 되지 않은 클린 페이지이다. The end of the attached items are clean page that is not yet the program. 즉, 클린 페이지에 도달하면, 맵핑 정보 복원 동작(혹은 스캔 동작)은 종료된다. In other words, when reaching the clean pages, the mapping information recovery operation (or a scanning operation) is terminated. 본 발명의 플래시 메모리 시스템(100)은 맵핑 정보 복원 동작시 페이지 스캔동작시 동시에 다음에 스캔될 페이지 정보를 읽는다. Flash memory system 100 of the present invention reads the information page to be scanned to the next page at the same time when the scanning operation during the mapping information recovery operation. 이를 위하여 각 페이지에는 다음에 스캔될 페이지 정보를 저장하고 있다. To this end each page and save the pages to be scanned next. 이러한 스캔 방식을 포워드 링크 스캔 방식(Forward Link Scanning)이라고 부르겠다. This scanning method'll call forward link scanning method (Forward Link Scanning). 본 발명의 포워드 링크 스캔 방식은 블록과 블록 사이의 경계를 넘어갈 때마다 별도의 메타 페이지 저장이 필요치 않는다. Forward link scanning method of the present invention does not need a separate meta-page storage each time they cross the boundary between the block and the block. 따라 메타 페이지 저장 빈도가 감소하게 된다. Depending is metapage stored frequency is reduced. 또한 본 발명의 포워드 링크 스캔 방식은 시작점의 페이지부터 클린 페이지가 발생된 페이지까지만 스캔하면 된다. In addition, forward link scanning method of the invention are scanned only when the page is generated from the clean page page of the starting point. 따라서 종래의 스캔 방식과 같이 모든 블록의 스페어 영역을 스캔할 필요가 없다. Therefore, it is not necessary to scan every block in the spare area as in the conventional scanning methods. 이에 본 발명의 포워드 링크 스캔 방식은 종래의 그것과 비교하여 스캔 시간을 크게 감소시킨다. The forward link scanning method of the present invention greatly reduces the scan time as compared with the prior art of it. 곧 본 발명의 포워드 링크 스캔 방식은 맵핑 정보 복원 시간을 크게 감소시킨다. Upcoming forward link scanning method of the present invention greatly reduces the mapping information recovery time. 그 결과로써 플래시 메모리 시스템의 초기화 시간이 크게 감소된다. The initialization time of the flash memory system is greatly reduced as a result. 본 발명은 플래시 메모리 시스템의 응용이 요구하는 초기화 시간의 제한에 따라 최대 연결된 항목의 개수를 제한할 수도 있다. The invention may limit the maximum number of associated items based on the limit of the setup time required by the application of a flash memory system. 예를 들어, 최대 연결된 항목의 개수를 256개로 제한할 경우에는, 플래시 메모리 시스템의 초기화 시간은 30ms(120μs * 256)이다. For example, a case to limit the maximum number of connected items 256, initialization time of the flash memory system is 30ms (120μs * 256). 여기서 120 μs는 한 페이지를 읽는데 걸리는 시간이다. The 120 μs is the time taken to read a page. 반면에 일반적인 스캔 방식의 사용하는 플래시 메모리 시스템에서는, 2GB의 메모리에 적용할 때 최악의 경우에 초기화 시간이 약 63s(120μs * 64 * 8192)이다. In contrast, a flash memory system using a general scan method, the worst of about 63s (120μs * 64 * 8192) the initialization time if when applying the memory of 2GB. 여기서 8282는 블록의 개수이다. Where 8282 is the number of blocks. 특히, 본 발명에 따른 포워드 링크 스캔 방식은 임의 쓰기(Random Write) 동작에 유리하다. In particular, forward link scanning method according to the invention is advantageous for any writing (Random Write) operation. 여기서 임의 쓰기 동작은 쓰기 동작을 수행할 어드레스가 연속되지 않고 임의적인 것을 의미한다. Wherein any write operation means an arbitrary address is not continuously perform the write operation. 도 9는 임의 쓰기 동작시 본 발명에 따른 포워드 링크 스캔 방식의 유리한 점을 설명하기 위한 도면이다. 9 is a view for explaining the advantages of forward link scanning method according to the present invention when any write operation. 도 9를 참조하면, 본 발명의 임의 쓰기 동작은 쓰기 동작시 논리 어드레스에 대응하는 최적의 물리적 저장 공간에 쓰기 동작이 수행되도록 한다. 9, a random write operation of the present invention is such that the write operation is performed in the optimal physical storage space corresponding to the logical address when a write operation. 임의 쓰기 동작은 다음과 같이 진행된다. Random write operation proceeds as follows. 쓰기 요청된 논리 페이지 번호가 100, 200,37,98,101이다. The letter requested logical page number 100, a 200,37,98,101. 우선 논리 페이지 번호(100)에 대응하는 가상 페이지 번호(1000)의 페이지에 데이터가 쓰여진다. First, the data in the page of the virtual page number 1000 is written corresponding to the logical page number (100). 이때, 가상 페이지 번호(1000)에 대응하는 논리 페이지 번호(100) 및, 다음에 스캔될 가상 페이지 번호(4003)가 함께 쓰여진다. At this time, the written with the virtual page number 4003, it is scanned on the logical page number 100 and, then corresponding to the virtual page number (1000). 여기서 가상 페이지 번호(4003)는 논리 페이지 번호(200)에 데이터가 쓰여질 때 최적화된 물리적 저장 공간을 나타낸다. The virtual page number 4003 indicates a physical storage area with a logical page number 200 is optimized when the data is written to. 여기서 최적화된 물리적 저장 공간은 머지 동작을 최소화시키는 등 플래시 메모리의 동작 성능을 향상시키는 곳을 말한다. The physical storage optimization refers to the place where such enhancement of the operational performance of the flash memory to minimize the merge operation. 이후, 가상 물리 페이지 번호(4003)의 페이지에 논리 페이지 번호(200)에 쓰여질 데이터가 쓰여진다. Then, the written data to be written to the physical page number, the virtual logical page number 200, a page of 4003. 이때 동시에 가상 페이지 번호(4003)에 대응하는 논리 페이지 번호(200) 및 다음에 스캔될 가상 페이지 번호(2001)가 함께 쓰여진다. At this time, at the same time written with the virtual page number (2001) it is scanned on the logical page number 200 and the next corresponding to the virtual page number 4003. 이후, 가상 물리 페이지 번호(2001)의 페이지에 논리 페이지 번호(37)에 쓰여질 데이터가 쓰여진다. Subsequently, it is written virtual physical page numbers (2001) page to be written to the logical page number (37) of the data. 이때 동시, 가상 페이지 번호(2001)에 대응하는 논리 페이지 번호(37) 및 다음에 스캔될 가상 페이지 번호(2002)가 함께 쓰여진다. At this time, the same time, the virtual page number (2001), the virtual page number (2002) is scanned on a logical page number (37) and then corresponding to the written together. 이후, 가상 물리 페이지 번호(2002)의 페이지에 논리 페이지 번호(98)에 쓰여질 데이터가 쓰여진다. Then, the virtual physical page number (2002) page, the data written to be written to the logical page number (98) in the. 이때 동시에 가상 페이지 번호(2002)에 대응하는 논리 페 이지 번호(98) 및 다음에 스캔될 가상 페이지 번호(1001)가 함께 쓰여진다. At this time, at the same time, it is written with the logical page number 98 and the next virtual page number 1001, is scanned in the corresponding to the virtual page number (2002). 이후, 가상 물리 페이지 번호(1001)의 페이지에 논리 페이지 번호(101)에 쓰여질 데이터가 쓰여진다. Then, the written data is to be written to the logical page number 101 to the page of the virtual physical page number 1001. 이때 동시, 가상 페이지 번호(1001)에 대응하는 논리 페이지 번호(101) 및 다음에 스캔될 가상 페이지 번호(1002)가 함께 쓰여진다. At this time, the same time, the virtual page number (1002) is scanned on the logical page number 101 and the next corresponding to the virtual page number 1001 is written together. 이와 같은 방법으로 임의 쓰기 동작이 수행되면, 최적화된 물리적 저장 공간에 쓰기 동작이 수행될 수 있다. If this way, a random write operation is performed, the write operation may be performed to optimize the physical storage space. 종래의 임의 쓰기 동작은 입력되는 임의의 논리 어드레스들에 따라 순차적으로 가상 어드레스가 부여되었다. Conventional random write operation was successively a virtual address assigned in accordance with any of the logical address inputted. 이로 인하여, 불필요한 머지 동작 및 그에 따른 시간 소비가 요구되었다. Due to this, unnecessary operation and soon it was time consuming due requirements. 예를 들어, 기존의 데이터에 업데이트를 수행할 경우가 그렇다. For example, it is the case for the update to the existing data. 만약, 업데이트 데이터가 저장되는 블록이 기존의 데이터가 저장된 블록과 다른 경우는, 기존 데이터 블록의 소거 동작, 기존 데이터의 복사 동작, 및 머지 동작 등 많은 쓰기 시간이 소요된다. If, when a block is updated data is stored in another block and the existing data is stored, the number of write time, such as an erase operation, a copy operation, and the remaining operation of the existing data on the existing data block is required. 반면에 본 발명의 임의 쓰기 동작은 이러한 머지 동작이 필요치 않게 된다. While any write operation of the present invention is to prevent such a merge operation required. 본 발명은 파일 변환 계층(FTL)은 논리 페이지 번호(LPN)에 대응하는 최적의 가상 물리 페이지 번호(VPN)을 계산한다. The present invention is a file conversion layer (FTL) is to calculate the best virtual physical page number (VPN) corresponding to the logical page number (LPN). 예를 들어, 기존의 데이터에 업데이트를 수행할 경우에, 최적의 가상 물리 페이지 번호(VPN)는 기존의 데이터가 저장된 동일한 블록으로 지정될 것이다. For example, when performing updates to the existing data, the optimal virtual physical page number (VPN) will be specified in the same block are stored, the existing data. 이 경우에는, 기존 데이터 블로의 소거 동작, 기존 데이터의 복사 동작, 및 머지 동작이 불필요하다. In this case, the copy operation, and a merge operation of the erase operation of the existing data in Pueblo, existing data is not required. 이에 따라, 본 발명의 임의 쓰기 동작은 쓰기 동작 시간을 크게 줄일 수 있다. Therefore, any write operation of the present invention can significantly reduce the write operation time. 도 10은 본 발명의 메타 블록에 대한 실시 예를 보여주는 도면이다. 10 is a view showing an embodiment of a meta-block of the present invention. 도 10을 참조하면, 메타 블록은 유효한 메타 블록(151,152) 및 무효한 메타 블록들(153,154,155,156,157,158)을 포함한다. Referring to Figure 10, the metablock include those available metablock 151 and 152 and invalid metablock (153154155156157158). 여기서 유효 및 무효의 판별은 에이지 값(age)이 가장 좋은 것으로 결정된다. The determination of valid and invalid values ​​are determined by age (age) is the best. 에이지 값(age)이 높으면 높을수록 가장 최근에 업데이트된 맵핑 정보임을 나타낸다. The higher age value (age) is high, indicates that the most recently updated mapping information. 도 11은 본 발명의 메타 블록의 항목들에 대한 실시 예를 보여주는 도면이다. 11 is a view showing an embodiment of the item in the metablock of the present invention. 도 11을 참조하면, 메타 블록은 메인 맵 블록, 프리 맵 블록, 및 복수의 맵 로그 블록들을 포함한다. Referring to Figure 11, a meta-block comprises a main block map landscape map block, and a plurality of block map log. 여기서 메인 맵 블록 및 프리 맵 블록은 메인 메타 블록이다. The main map, and free block map, the block is the main metablock. 각 페이지는 논리 대 가상 페이지 어드레스 맵핑 정보(L2V)을 저장하는 메인 영역과, 에이지 값(age)을 저장하는 스페어 영역으로 구분된다. Each page is divided into a logical-to-virtual page address mapping to the main storage area for information (L2V), the spare area for storing the age value (age). 맵 로그 블록들은 업데이트 메타 블록이다. Map log blocks are updated meta-block. 각 페이지는 컨텍스(CTX)와 로그(Log)가 저장된 메인 영역과, 에이지 값이 저장된 스페어 영역으로 구분된다. Each page is divided into spare area and the main area, the context (CTX) and the log (Log) is stored, the stored age values. 여기서 컨텍스에는 스캔 동작을 시작하는 시작점이 포함되고, 로그에는 업데이트된 맵핑 정보가 포함된다. The context will contain a start point to start a scanning operation, the log includes the updated mapping information. 맵 로그 블록은 업데이트 맵핑 정보만 저장된다. Map log block is stored only updates the mapping information. 이후 업데이트된 매핑 정보가 일정한 용량을 초과할 때, 맵 로그 블록들의 전체 업데이트 맵핑 정보는 메인 맵 블록으로 반영된다. After a full update of the map information when the updated mapping information exceeds the predetermined capacity, the log block map are reflected in the main map block. 이때, 최신의 맵핑 정보가 메인 맵 블록에 반영되었으므로, 모든 맵 로그 블록들은 소거될 수 있다. In this case, since the latest mapping information reflected in the main block map, all maps log block can be erased. 도 12는 본 발명의 플래시 메모리 시스템에서 초기화 동작시 맵핑 정보를 복원하는 과정을 보여주는 도면이다. 12 is a view showing the step of reconstructing an initializing mapping information in operation in a flash memory system of the present invention. 도 12를 참조하면, 본 발명의 초기화 동작시 맵핑 정보 복원 과정은 크게 (a) 업데이트 맵핑 정보 읽기 동작, (b) 액티브 페이지 스캔 동작, (c) 최종 맵핑 테이블 완성으로 구분된다. 12, the restoring mapping during the initialization operation of the invention process, the information is significant (a) is separated by updating the mapping information read operation, (b) an active page scan operation, (c) the final mapping table complete. 도 13은 본 발명에 따른 플래시 메모리 시스템의 맵핑 정보 복원 과정을 보여주는 흐름도이다. 13 is a flow chart illustrating the mapping information recovery process of a flash memory system according to the present invention. 도 12 및 도 13을 참조하면, 플래시 메모리 시스템(100)에 전원이 공급될 경우에 종료 전의 마지막 맵핑 상태를 복원하는 과정은 다음과 같다. Even when 12 and 13, the process of restoring the last mapping in the state before the end when the power is supplied to the flash memory system 100 is as follows. 먼저, 유효 메인 메타 블록(151,메인 맵 블록)으로부터 맵핑 정보를 읽어와 램에 저장해 둔다. First, the effective main meta-blocks (151, the main map blocks) and stored in the RAM and read from the mapping information. 여기서 읽어온 맵핑 정보에는 논리 대 가상 어드레스 맵핑 정보로서, 메인 맵 블록이 쓰여질 당시 맵핑 상태를 갖는다(S110). Where one has a mapping information, the logical-to-virtual address mapping information to read, at the time of the mapping conditions, the main map blocks to be written (S110). 다음에, 업데이트된 맵핑 정보는 유효 업데이트 메타 블록(152, 맵 로그 블록)에 저장되어 있다. Next, the updated map information is stored in the valid update metablock (152, log block map). 따라서, 유효 업데이트 메타 블록(152)을 한 페이지씩 읽어가면서 램 상에 최신 맵 정보가 업데이트된다(S120). Thus, the effective update is going meta block 152 reads one page is updated on the latest map information RAM (S120). 맵 로그 블록의 마지막 메타 페이지에는 시작점이 저장되어 있다. The last page of the map meth log block is the start point are stored. 이 시작점으로부터 아직 유효 업데이트 메타 블록(맵 로그 블록)에 저장되지 않는 액티브 페이지들이 스캔된다. Active page that is not yet stored in the valid update metablock (log block map) from the starting point that is scanned. 시작점이 지시하는 물리 페이지부터 스페어 영역의 링크 값(LINK)을 참조하여 포워드 링크 스캔 동작이 수행된다. From the physical page for a link value (LINK) of the spare area by the forward link scanning operation is performed to the starting point is indicated. 최종적으로 포워드 링크가 가리키는 페이지가 프로그램되지 않는 클린 페이지일 경우에, 포워드 링크 스캔 동작이 완료된다(S130). And finally in the case of clean pages forward link page is not pointing program, complete the forward link scanning operation (S130). 액티브 페이지들의 스캔을 통해 구성된 논리 대 가상 페이지 어드레스 맵핑 정보는 램에 위치하고 있는 전체 논리 대 가상 맵핑 정보(L2V)의 맵핑 데이블에 반영된다. Logical-to-virtual page address mapping information is configured by the scan of the active page are reflected in the mapping table of the entire logical-to-virtual mapping information (L2V) is located in the RAM. 이로써, 플래시 메모리 시스템(100)의 초기화 동작시 맵핑 정보 복원 동작이 완료된다(S140). Thus, the mapping information recovery operation is completed during the initialization operation of the flash memory system (100) (S140). 상술 된 본 발명의 플래시 메모리 시스템에서는 논리 페이지 어드레스가 가상 페이지 어드레스로 맵핑되는 맵핑 정보에 대한 복원 과정을 다루었다. The flash memory system of the present invention described above dealt with the restoration process of the map information to the logical page address is mapped to the virtual page address. 그러나 본 발명이 맵핑 정보 복원 과정이 반드시 여기에 국한될 필요는 없다. However, it is not necessarily the invention the mapping information recovery process needs to be limited to this. 본 발명의 맵핑 정보 복원 과정은 논리 어드레스에 대응하는 물리 어드레스의 복원 과정을 필요로 하는 다른 복원 방식에도 적용가능하다. Mapping information restoration process of the present invention is also applicable to other recovery methods that require restoration process of the physical address corresponding to the logical address. 본 발명의 플래시 메모리 시스템은 메모리 카드 및 SSD에 적용가능하다. Flash memory system of the present invention is applicable to a memory card and SSD. 도 14는 본 발명에 따른 SSD 메모리 시스템(200)을 보여주는 도면이다. 14 is a view showing the SSD memory system 200 in accordance with the present invention. 도 14를 참조하면, SSD 메모리 시스템(200)은 SSD 제어기(250)와 플래시 메모리들(261~4,271~4,281~4,291~4)을 포함한다. Referring to Figure 14, the SSD memory system 200 includes the SSD controller 250 and the flash memory (261 ~ 4,271 ~ 4,291 ~ 4,281 ~ 4). SSD 제어기(250)는 도 1에 도시된 플래시 제어기(130)의 기능을 갖고, 도 1 내지 도 13에 상술된 바와 같이 쓰기 동작 및 맵핑 정보 복원 동작을 수행한다. SSD controller 250 performs a write operation and a mapping information recovery operation as described above in a function, from 1 to 13 also have the flash controller 130 shown in FIG. 플래시 메모리들(261~4,271~4,281~4,291~4)은 도 1에 도시된 플래시 메모리(140)와 같이 쓰기 동작시 사용자 데이터와 함께 논리 페이지 어드레스와 다음에 스캔할 링크 값이 저장된다. Flash memory (261 ~ 4,271 ~ 4,281 ~ 4,291 ~ 4) is a link value to be scanned on the logical page address and then together with the user data during a write operation, such as the flash memory 140 shown in Figure 1 is stored. 다시 도 14를 참조하면, 프로세서(210)는 호스트로부터 명령어를 전달받아 호스트로부터의 데이터를 플래시 메모리에 저장할지 혹은 플래시 메모리의 저장 데이터를 읽어 호스트로 전송할 지의 여부를 결정하고 제어한다. Referring back to Figure 14, processor 210 determines whether to transmit data from the host receives a command from the host to the host to read the stored data of whether or flash memory in the flash memory and control. ATA 호스트 인터페이스(220)는 상술한 프로세서(210)의 제어에 따라 호스트 측과 데이터를 교환한다. ATA host interface 220 exchanges data with the host side in accordance with the control of the above-described processor 210. The ATA 호스트 인터페이스(220)는 호스트측으로부터 명령어 및 주소를 패치하여 CPU 버스를 통해서 프로세서(210)로 전달한다. ATA host interface 220 to fetch the command and address from the host and transmitted to the processor 210 through the CPU bus. 여기서 ATA 호스트 인터페이스(220)는 SATA 인터페이스, PATA 인터페이스, 및 ESATA(External SATA) 인터페이스 등 중에 서 어느 하나이다. The host ATA interface 220 is any document, such as the SATA interface, a PATA interface, and ESATA (External SATA) interface. ATA 호스트 인터페이스(220)를 통해 호스트로부터 입력되는 데이터나 호스트로 전송되어야 할 데이터는 프로세서(210)의 제어에 따라 CPU 버스를 경유하지 않고 캐시 버퍼 램(240)를 통해 전달된다. Data to be transmitted to the host data or input from the host through the host ATA interface 220 is passed through the cache buffer RAM 240 without passing through the CPU bus in accordance with the control of the processor 210. 램(230)은 플래시 메모리 시스템(200)의 동작에 필요한 데이터를 임시로 저장하는데 이용된다. RAM 230 is used to store the data required for the operation of a flash memory system 200 on a temporary basis. 이러한 램(230)는 휘발성 메모리 장치로써, DRAM, SRAM 등이 될 수 있다. The RAM 230 may be as a volatile memory device, DRAM, SRAM and the like. 캐시 버퍼 램(240)는 호스트와 플래시 메모리들(261~4,271~4,281~4,291~4) 간의 이동 데이터를 일시 저장한다. The cache buffer RAM 240 is temporarily stored in a move data between the host and the flash memory (261 ~ 4,271 ~ 4,291 ~ 4,281 ~ 4). 또한 캐시 버퍼 램(230)는 프로세서(210)에 의해서 운용될 프로그램을 저장하는 데에도 사용된다. In addition, the cache buffer RAM 230 is also used to store a program to be operated by the processor 210. 캐시 버퍼 램(230)는 일종의 버퍼 메모리로 간주할 수 있으며, SRAM으로 구현될 수 있다. Cache RAM buffer 230 may be thought of as a kind of buffer memory and can be implemented in SRAM. SSD 제어기(250)는 저장 장치로 사용되는 플래시 메모리들과 데이터를 주고받는다. SSD Controller 250 may send and receive data and a flash memory used as a storage device. SSD 제어기(250)는 낸드 플래시 메모리, 원내드(One-NAND) 플래시 메모리, 혹은 멀티-레벨 플래시 메모리를 지원하도록 구성될 수 있다. May be configured to support the level flash memory - SSD controller 250 is a NAND flash memory, de-hospital (One-NAND) flash memory, or multiple. 본 발명에 따른 파일 변환 계층의 맵핑 방법을 적용하는 플래시 메모리 시스템은 성능 저하 및 초기화 시간을 최소화시키는 맵핑 정보 복원이 가능하게 된다. Flash memory systems to apply the method of mapping the file conversion layer according to the present invention is to enable the mapping information recovery which minimizes the performance degradation and the initialization time. 본 발명에 따른 플래시 메모리 시스템은 이동형 저장 장치로서 사용될 수 있다. Flash memory system according to the present invention can be used as a portable storage device. 따라서, MP3, 디지털 카메라, PDA, e-Book의 저장 장치로서 사용될 수 있다. Accordingly, it can be used as a storage device in the MP3, digital camera, PDA, e-Book. 또한, 디지털 TV나 컴퓨터 등의 저장 장치로서 사용될 수 있다. In addition, it can be used as a storage device, such as a digital TV or computer. 본 발명에 따른 플래시 메모리 시스템 또는 저장 장치는 다양한 형태들의 패키지를 이용하여 실장 될 수 있다. A flash memory system or storage device according to the present invention can be implemented using various types of packages. 예를 들면, 본 발명에 따른 플래시 메모리 시스템 또는 저장 장치는 PoP(Package on Package), Ball grid arrays(BGAs), Chip scale packages(CSPs), Plastic Leaded Chip Carrier(PLCC), Plastic Dual In-Line Package(PDIP), Die in Waffle Pack, Die in Wafer Form, Chip On Board(COB), Ceramic Dual In-Line Package(CERDIP), Plastic Metric Quad Flat Pack(MQFP), Thin Quad Flatpack(TQFP), Small Outline(SOIC), Shrink Small Outline Package(SSOP), Thin Small Outline(TSOP), Thin Quad Flatpack(TQFP), System In Package(SIP), Multi Chip Package(MCP), Wafer-level Fabricated Package(WFP), Wafer-Level Processed Stack Package(WSP), 등과 같은 패키지들을 이용하여 실장될 수 있다. For example, a flash memory system or storage device according to the invention (Package on Package) PoP, Ball grid arrays (BGAs), Chip scale packages (CSPs), Plastic Leaded Chip Carrier (PLCC), Plastic Dual In-Line Package (PDIP), Die in Waffle Pack, Die in Wafer Form, Chip On Board (COB), Ceramic Dual in-Line Package (CERDIP), Plastic Metric Quad Flat Pack (MQFP), Thin Quad Flatpack (TQFP), Small Outline ( SOIC), Shrink Small Outline Package (SSOP), Thin Small Outline (TSOP), Thin Quad Flatpack (TQFP), System In Package (SIP), Multi Chip Package (MCP), Wafer-level Fabricated Package (WFP), Wafer- Level Processed Stack package can be mounted using packages such as (WSP),. 한편, 본 발명의 상세한 설명에서는 구체적인 실시 예에 관하여 설명하였으나, 본 발명의 범위에서 벗어나지 않는 한도 내에서 여러 가지로 변형할 수 있다. On the other hand, the invention has been shown and described with respect to certain preferred embodiments thereof, it can be modified in various ways within the limits that do not depart from the scope of the invention. 그러므로 본 발명의 범위는 상술한 실시 예에 국한되어 정해져서는 안되며 후술하는 특허 청구 범위뿐만 아니라 이 발명의 특허청구범위와 균등한 것들에 의해 정해져야 한다. While the invention will be defined by the appended claims and equivalents of the invention as well as the claims below should not jeonghaejyeoseo limited to the embodiments described above ones. 도 1은 본 발명에 따른 플래시 메모리 시스템의 하드웨어 구조를 보여주는 블록도이다. Figure 1 is a block diagram showing the hardware structure of the flash memory system according to the present invention. 도 2는 본 발명에 따른 플래시 메모리 시스템의 소프트웨어 구조상에 파일변환계층의 위치를 보여주는 블록도이다. Figure 2 is a block diagram showing the location of the file conversion layer in the software structure of a flash memory system according to the present invention. 도 3은 본 발명에 따른 파일 변환 계층을 설계하기 위하여 고려한 관점들을 보여주는 도면이다. Figure 3 is a block diagram showing the point of view taking into account to design a file conversion layer according to the present invention. 도 4은 본 발명에서 파일 변환 계층의 동작 효율이 증가된다는 개념을 설명하기 위한 도면이다. Figure 4 is a view for explaining a concept that the operating efficiency of the file conversion layer increases from the present invention. 도 5는 본 발명에 따라 맵핑 정보를 복원하는데 필요한 맵핑 관련 정보를 저장하고 있는 메모리 영역을 보여주는 도면이다. 5 is a view showing a memory area that stores the mapping information needed to restore the mapping information in accordance with the present invention. 도 6은 본 발명에 따른 2KB 페이지의 구성을 보여주는 도면이다. 6 is a view showing a configuration of a 2KB page in accordance with the present invention. 도 7은 본 발명에 따른 4KB 페이지의 구성을 보여주는 도면이다. 7 is a view showing a configuration of a 4KB page in accordance with the present invention. 도 8은 링크 값에 의한 액티브 페이지의 구성 예를 보여주는 도면이다. 8 is a view showing a configuration example of the active page by a link value. 도 9는 임의 쓰기 동작시 본 발명에 따른 포워드 링크 스캔 방식의 유리한 점을 설명하기 위한 도면이다. 9 is a view for explaining the advantages of forward link scanning method according to the present invention when any write operation. 도 10은 본 발명의 메타 블록에 대한 실시 예를 보여주는 도면이다. 10 is a view showing an embodiment of a meta-block of the present invention. 도 11은 본 발명의 메타 블록의 항목들에 대한 실시 예를 보여주는 도면이다. 11 is a view showing an embodiment of the item in the metablock of the present invention. 도 12는 본 발명의 플래시 메모리 시스템에서 초기화 동작시 맵핑 정보를 복 원하는 과정을 보여주는 도면이다. 12 is a view illustrating a process desired repeat the mapping information during the initialization operation in the flash memory system of the present invention. 도 13은 본 발명에 따른 플래시 메모리 시스템의 맵핑 정보 복원 과정을 보여주는 흐름도이다. 13 is a flow chart illustrating the mapping information recovery process of a flash memory system according to the present invention. 도 14는 본 발명에 따른 SSD 시스템을 보여주는 도면이다. 14 is a view showing a SSD system according to the present invention. 데이터 복원 동작을 수행할 때, 상기 링크 값을 이용한 스캔 동작이 수행되는 메모리 장치. When performing a data recovery operation, the memory device to which the scanning operation using the link value do. 맵핑 정보 복원시 상기 링크 값에 따라 다음 페이지를 스캔하는 포워드 링크 스캔 방식이 사용되는 메모리 장치. Mapping information when restoring the forward link Scan as a memory device used to scan the next page in accordance with the link value. 상기 포워드 링크 스캔 방식으로 얻게 된 맵핑 정보가 저장되는 업데이트 메타 블록을 포함하는 메모리 장치. A memory device including a map update metablock that stores information obtained by the forward link scan. 상기 업데이트 메타 블록은 상기 맵핑 정복 복원시 상기 포워드 링크 스캔 동작을 시작하는 페이지를 지시하는 시작점을 저장하는 메모리 장치. The update metablock memory device for storing a start point indicative of a page to start the scanning operation when restoring the forward link mapped to conquer. 상기 포워드 링크 스캔 동작은 사용자 데이터가 저장되지 않은 페이지에 도달할 때 종료되는 메모리 장치. The forward link, the scanning operation is a memory device is terminated when it reaches the page that is not user data is stored. 데이터 복원 동작을 수행할 때, 상기 링크 값을 이용한 스캔 동작이 수행되는 메모리 시스템. When performing a data recovery operation, the memory system in which the scanning operation using the link value do. 상기 메모리 제어기는 초기화 동작시 상기 메타 영역으로부터 읽어온 상기 제 1 맵핑 정보와, 상기 사용자 데이터 영역을 상기 링크 값에 따라 포워드 링크 스캔 동작을 수행하여 얻게 된 제 2 맵핑 정보로부터 맵핑 정보를 복원하는 메모리 시스템. The memory controller includes a memory to restore the mapping information from and on the first mapping information read from the meta area during initializing operation, the second mapping information obtained by performing the forward link, the scanning operation according to the user data area on the link value system. 상기 메타 영역은 상기 제 2 맵핑 정보 및 상기 포워드 링크 스캔 동작이 시작될 페이지를 지시하는 시작점이 저장되는 업데이트 메타 블록을 포함하는 메모리 시스템. The metadata area is a memory system including the update metablock is the starting point to indicate the page, wherein said second mapping information and the forward link, the scanning operation is started stored. 상기 제어기는 외부로부터 입력된 논리 어드레스에 따라 상기 다음에 억세스될 페이지를 지시하는 상기 링크 값을 계산하는 파일변환계층을 포함하는 메모리 시스템. Wherein the controller is a memory system in accordance with the logical address input from the outside include a file conversion layer of calculating the link value indicating a page to be accessed in the following. 상기 제 1 맵핑 정보와 상기 제 2 맵핑 정보를 이용하여 맵핑 정보를 복원하는 복원 방법. Restore To restore the mapping information using the second mapping information and the first mapping information.